The speaker in a Jund al-Aqsa video with an armed operative by his side (Jund al-Aqsa’s official Twitter account, November 13, 2015). Syrian Army positions taken over by Jund al-Aqsa southeast of Morek (Jund al-Aqsa’s official Twitter account, November 13, 2015). 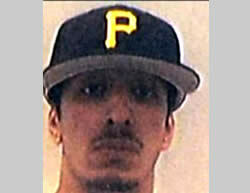 Mohammed Emwazi, aka Jihadi John (almnatiq.net, November 13, 2015). The main events of the week were the shooting and suicide bombing attacks carried out by ISIS in Paris by eight terrorists operating at six different sites. At least 130 people were killed in the terror attack. This operation, which was carefully planned and directed by ISIS, is a deviation from ISIS’s known modus operandi in Western countries. The Paris attack was preceded by two other killing attacks (interception of the Russian aircraft and a suicide bombing attack in the Hezbollah-controlled southern suburb of Beirut). These attacks demonstrate ISIS’s operational ability to carry out complex attacks in various locales far from its bastions of power in Syria and Iraq. The attacks were followed by an ISIS media campaign threatening to carry out additional attacks against France and other Western countries. In the meantime, ISIS suffered a few painful failures on the ground: in Iraq, the Kurdish forces liberated the area of Sinjar and cut off the main supply route between Mosul and Al-Raqqah; in Syria, the Syrian Army had a few successes to the east and south of Aleppo. 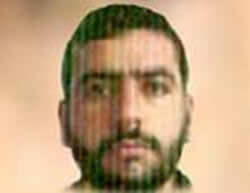 In addition, several senior operatives who either belonged to ISIS or were affiliated with it were killed: Abu Ali al-Baridi, commander of the ISIS-affiliated Shuhada al-Yarmouk Brigade, which operates in the southern Golan Heights, was killed in a suicide bombing attack initiated by the Al-Nusra Front; the British terrorist codenamed Jihadi John was killed in a US airstrike around the city of Al-Raqqah; and Wissam Abd al-Zubaydi, ISIS’s leader in Libya, was killed in a US airstrike around Derna. All of these are operational and image-related blows to ISIS, which are liable to impel it to carry out further showcase attacks outside Syria and Iraq. Syria– the airstrikes were concentrated in the areas of Al-Hawl (east of Al-Hasakah), Palmyra, Al-Raqqah, Abu Kamal, and Deir al-Zor. The airstrikes targeted ISIS tactical units, buildings, and one ISIS operative. Iraq– the airstrikes were concentrated in the areas of Haditha, Kisik (west of Mosul), Ramadi, Sinjar, Baiji, Mosul and Tal Afar (west of Mosul). The airstrikes targeted ISIS assault positions, an ISIS command and control center, positions and bunkers, a bridge, armories, staging areas for ISIS operatives, vehicles, weapons, self-produced IEDs, and car bombs. Following are details regarding the targets that were destroyed or damaged in the airstrikes: 126 tanks, 354 Humvees, 561 outposts, 3,956 buildings, 3,930 combat positions, 232 oil facilities, 4,622 other targets (US Department of Defense website, based on information from CENTCOM, October 8, 2015). The cost of the campaign against ISIS has reached USD 5 billion (US Department of Defense website, October 31, 2015). On November 15, 2015, twelve French planes carried out an airstrike against ISIS targets of the city of Al-Raqqah, ISIS’s so-called capital in Syria. According to reports, the French carried out another airstrike in Al-Raqqah on the night of November 16-17, 2015. The airstrike was carried out in the wake of the terrorist attacks in Paris. The sites that were attacked in the first airstrike included a headquarters, a recruitment center, an armory and a training camp. According to sources the ITIC believes are affiliated with ISIS, civilian targets such as a stadium, museums and buildings housing political entities were attacked. According to The New York Times, the decision to attack was made on November 14, 2015, at a meeting of the French president and the national security team. The airstrike was carried out in coordination with US forces, who provided the French with intelligence on ISIS targets in Syria (nytimes.com, November 15, 2015). According to Alexander Bortnikov, head of the Russian Federal Security Service (FSB), the Russian plane crash in Sinai was caused by the explosion of an IED weighing about one kilogram.He said that it was definitely an act of terrorism (ITAR-TASS, Sputnik). In consequence, Russian President Putin announced (November 17, 2015) that his country would expand its airstrikes against ISIS in Syria. During the past week, Russian Air Force jets carried out a large number of airstrikes in Syria. In the ITIC’s assessment, most of them were not carried out against ISIS targets. The airstrikes were concentrated on the areas of Aleppo, Idlib, Homs, Latakia, Damascus, Daraa and Deir al-Zor. According to Russian Ministry of Defense Spokesman Igor Konashenkov, the airstrikes damaged ISIS observation and battle positions, fuel tanks and ammunition depots, weapons, workshops for manufacturing ammunition and IEDs, training camps, outposts and fortified sites (rt.com, November 13, 2015). On November 14, 2015, photos were published originating from ISIS’s Al-Raqqah province, showing the results of airstrikes carried out by Russian aircraft against the city of Al-Raqqah. The photos show destroyed buildings, fire and smoke rising from the rubble, and a crater that formed in the ground (muslims-news.net, November 14, 2015). According to the Russian Federal Security Service (FSB), 7,000 citizens of the former USSR have left the country and joined ISIS in Syria and Iraq. In the ITIC’s assessment, this large number of operatives has the potential to carry out acts of terror and subversive activity in Russia and the Caucasus when they return to their home countries after fighting in Syria. According to Russian Prosecutor General Yuri Chika, Russia has stepped up its monitoring of money transfers from Russia to countries where terrorist activity is carried out.He made these remarks at a conference of the International Union of Prosecutors of Central and Eastern Europe and East Asia. According to him, increasing the monitoring of money transfers to areas where terrorist groups are in control enables Russia to arrest terrorists using legal tools. Chika stressed that the Russian Supreme Court has designated ISIS and the Al-Nusra Front as terrorist organizations (TASS, November 10, 2015). In the rural area of Aleppo,the Syrian Army has had a number of successes since early November. The Syrian Army managed to take over the important city of Al-Safirah, southeast of Aleppo (early November 2015) and lifted the siege on the Kuweyres military airbase (November 10, 2015). The Syrian Army also reportedly advanced toward the highway between Aleppo and Idlib (November 12-13, 2015). However, the fighting is still ongoing between the Syrian Army and the rebel organizations in the rural area south of Aleppo, and neither side has emerged a victor. According to reports on social networks, Qods Force commander Qassem Soleimani is currently in the area south of Aleppo. The Qods Force commands forces of Iran, Hezbollah and the Shiite militias, and coordinates the attack with the Syrian Army. ISIS operatives are trying to exert pressure on the Syrian Army troops at the Kuweyres military airbase. They are doing so by detonating car bombs and firing mortar shells. 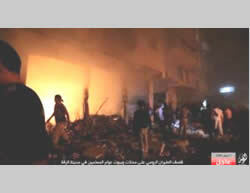 According to ISIS’s Aleppo province, two attacks were carried out, in which two car bombs were detonated. 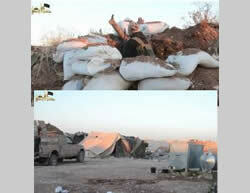 According to the announcement, over 50 Syrian Army combatants were killed and wounded in these explosions. The rebel organizations, of which the most prominent is the Al-Nusra Front, are now concentrating large forces in the rural area of Aleppo in order to carry out a counterattack.These forces reportedly include more than 6,000 operatives equipped with armored vehicles and anti-tank weapons (Twitter account affiliated with the Al-Nusra Front, November 14, 2015). Several rebel organizations, including Jaysh al-Fatah and Ahrar al-Sham, have declared a state of emergency and called for a general mobilization to protect the rural area south of the Aleppo (Al-Mayadeen, November 17, 2015). 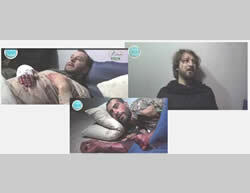 On November 15, 2015, the Al-Nusra Front announced the capture of three Hezbollah operatives during the battles taking place in the rural area south of Aleppo. Videos posted by the Al-Nusra Front’s media foundations made use of propaganda through “interviews” with the three operatives. According to Mohammed Mahdi Shu’aib, one of the operatives, the operation in the rural area of Aleppo was carried out under the command of Quds Force Commander Qassem Soleimani. According to him, there are Iranian fighters in the area, along with Iraqi fighters and Lebanese Hezbollah operatives. He said that each of these forces was fighting on a different front. According to him, the Syrian Army has a limited presence on the ground and is not playing a significant role in the battles. According to another Hezbollah operative, Hassan Nazih Taha, the Iranians are commanding the military operations while the fighters are Iraqis, Afghans and Hezbollah operatives (Al-Jazeera TV, November 15, 2015). In the rural area north of Hama, fierce battles around the town of Morek (approximately 26 km north of Hama)continued this week. The battles are between the Syrian Army and various rebel organizations, including Islamic-jihadi factions (most notably Jund al-Aqsa, a group that left the Al-Nusra Front). On November 13, 2015, Jund al-Aqsa’s official Twitter account posted videos showing the takeover of a Syrian outpost by Jund al-Aqsa operatives southeast of Morek. The speaker in the video says that they killed 20 Hezbollah operatives and expresses his hope that they will advance toward Soran and from there to Hama (Jund al-Aqsa’s official Twitter account, November 13, 2015). Fighting took place west of Palmyra between the Syrian Army and ISIS operatives.According to a report by ISIS’s media foundation Aamaq from November 14, 2015, around 50 Syrian Army soldiers were killed and four armored vehicles were destroyed. This is a result of the detonation of IEDs planted by ISIS operatives on the highway west of Palmyra. ISIS also reported that its operatives had taken over two checkpoints and positions of the Syrian regime’s forces in a mountain range west of Palmyra (Aamaq, November 14, 2015). The Shuhada al-Yarmouk Brigade (the Al-Yarmouk Martyrs Brigade), an ISIS-affiliated military framework that operates in the southern Syrian Golan Heights, suffered a serious blow this week when the Al-Nusra Front managed to eliminate its senior command. On November 15, 2015, Shuhada Al-Yarmouk Commander Abu Ali al-Baridi, aka Uncle Abu Ali (Al-Khal Abu Ali), was eliminated. Two senior commanders in the brigade were killed along with him. 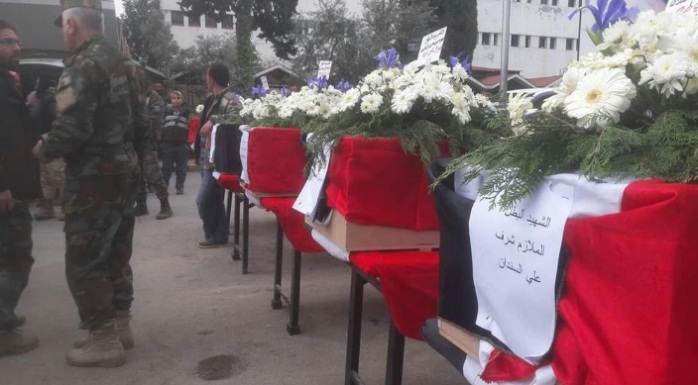 They were eliminated by an Al-Nusra Front suicide bomber in the town of Jumla (31 km northwest of Daraa). The suicide bombing attack was carried out during a meeting of the brigade’s commanders. Al-Nusra Front operatives celebrated the elimination of Al-Baridi by shooting in the air (syriahr.com, November 15, 2015). On its Twitter page, Shuhada Al-Yarmouk Brigade’s information office announced the death of the brigade’s commander, along with two other operatives. The posting says that the organization has appointed a new commander (“Emir”), codenamed Abu Obeida Qahtan. The brigade operatives have pledged allegiance to him (Twitter page of the Shuhada Al-Yarmouk Brigade’s information office; bwabtk.com, November 15, 2015). Following the elimination of the top command of the brigade, its operatives have apparently attempted to take over several villages in the rural area of Daraa from the Al-Nusra Front. They took over the village of Saham al-Jawlan (northwest of Daraa) but a few hours later, Al-Nusra Front operatives managed to retake the village. At least 18 Shuhada al-Yarmouk Brigade operatives and 13 operatives of the Al-Nusra Front and other Islamist organizations have been killed in these battles (Syriahr.com, November 15, 2015). The main development in Iraq this week was the liberation of the city of Sinjar and the surrounding region from the hands of ISIS by the Kurdish forces. The city was liberated by Kurdish Peshmerga fighters, assisted by Yazidi fighters and with air support provided by the US-led coalition. The Kurdish forces reportedly took over from ISIS around 150 square kilometers in the area of Sinjar. They now control key locations on Highway 47, the main supply route between Al-Raqqah (ISIS’s so-called capital in Syria) and Mosul (ISIS’s so-called capital in Iraq). The Kurdish forces are reportedly preparing to take over the city of Tal Afar, which lies between Sinjar and Mosul. The city of Sinjar and the entire region were taken over by ISIS in August 2014, at a time when ISIS was enjoying major successes in Iraq. Sinjar is the home of Iraq’s Yazidi community, whose members have been murdered, raped and sold into slavery by ISIS. According to reports, after the takeover of Sinjar by the Kurdish forces, a mass grave containing the bodies of 78 women was discovered there. Following the takeover of Sinjar, with the Kurdish flag flying in the city center, Masoud Barzani, President of the Kurdistan Region, convened a press conference. 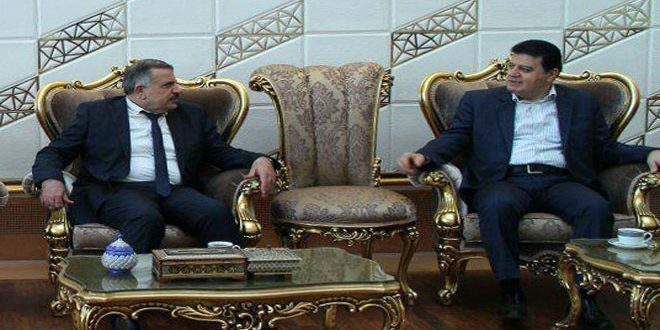 He praised the forces that captured Sinjar, thanked the coalition and US for their assistance and declared that the war against ISIS was not only a war of the Kurds, but a war of the entire international community. The takeover of the city of Sinjar by the Kurdish forces represents another defeat for ISIS in Iraq, following the takeover of the cities of Tikrit and Baiji by the Iraqi Army and Shiite militias. It symbolizes that the momentum of ISIS’s successes has been halted, at least in Iraq, with ISIS gradually losing important places to the Iraqi Army, the Shiite militias supported by Iran, and the Kurdish forces. At the operative level, cutting off Highway 47, the main route between Mosul and Al-Raqqah, is expected to make it difficult for ISIS to move its operatives and supplies between Iraq and Syria, although it will not prevent it entirely (there are other available routes between Iraq and Syria). The takeover of Sinjar also symbolizes the importance of the Kurdish forces as a reliable and efficient ally, and illustrates their great contribution to the war effort against ISIS, in both Iraq and Syria. Fighting between the Iraqi Army and ISIS operatives in the city of Ramadi and the surrounding area continues: on November 12, 2015, ISIS issued a video documenting the fighting in eastern Ramadi. The video shows a battle that took place late at night and continued until the early hours of the morning. During the battle, ISIS operatives took over an Iraqi Army post (archive.org, November 12, 2015). 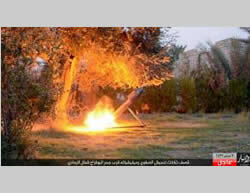 In addition, on November 15, 2015, ISIS published a number of photos documenting rockets being fired at Iraqi Army bases north of the city of Ramadi (www.csnw.tk, November 15, 2015). On November 15, 2015, ISIS published photos documenting a Kornet anti-tank missile being fired at an Iraqi Army Humvee near the town of Haditha, in the western Al-Anbar province (Akhbar al-Muslimeen, November 15, 2015). ISIS continues to initiate multi-casualty suicide bombings directed at Shiite targets in Baghdad (residential neighborhoods, concentrations of Shiite militias). On November 13, 2015, ISIS claimed responsibility for three suicide bombings against Shiite targets in the city of Baghdad. According to ISIS, three terrorists wearing explosive belts blew themselves up at bases of the Shiite militias that support the Iraqi Army. According to ISIS, these attacks killed some sixty people and injured dozens more (Aamaq, November 13, 2015). In the early evening of November 12, 2015, ISIS carried out a terrorist attack in a southern Shiite Hezbollah-controlled suburb of Beirut.Forty-three people were killed, most of them passersby, and around 240 were injured (according to Al-Jazeera, quoting the Lebanese Ministry of Health). The blasts also caused considerable destruction. The attacks were carried out by two suicide bombers wearing explosive belts, who blew themselves up almost simultaneously near Al-Rassoul al-Aazam Hospital. ISIS in Lebanon claimed responsibility for the attack via its social media, in an announcement published on November 12, 2015. 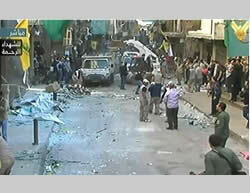 According to the announcement, ISIS operatives had succeeded in carrying out an attack in the Hezbollah stronghold of Burj al-Barajneh using a booby-trapped motorcycle, attacking crowded areas in the southern suburb of Beirut (muslims-news.net, November 12, 2015). According to the Lebanese interior minister, five suicide bombers were supposed to participate in the attack. It was the first suicide bombing attack carried out in the southern suburb of Beirut, Hezbollah’s stronghold, since the summer of 2014. It was also the most serious attack carried out in Lebanon since the beginning of Hezbollah’s involvement in the fighting in Syria. For a relatively long period of time, the achievements of the Syrian Army and Hezbollah in the Qalamoun Mountains, along with Hezbollah's preventive measures in Lebanon in general and Beirut in particular, had hampered the military capabilities of ISIS and the other jihadi organizations, and prevented them from carrying out their planned terrorist attacks in the Shiite neighborhoods of Beirut. This time, however, ISIS managed to carry out combined suicide bombing attacks in the heart of Hezbollah’s stronghold, killing and wounding many. On the night of November 13, 2015, ISIS carried out a coordinated terrorist attack in six locations in Paris. Three squads carried out the attack, involving eight terrorist operatives. According to Paris Prosecutor François Molins, at least 130 people were killed. Three hundred fifty-two people were injured, 99 of them critically or mortally. The worst terrorist attack on French soil since the Second World War, it was a seminal event for the French. It was also the largest attack ISIS has carried out in the West. ISIS claimed responsibility for the attack and launched a media campaign threatening France and other Western countries with more attacks. The modus operandi of the attack differed from ISIS's operations in the West so far. Since the attacks of the US-led coalition against ISIS began and until recently, ISIS's attacks in Western countries have been operationally unsophisticated and simple. They have been mostly carried out by lone operatives in solidarity with or inspired by ISIS, but not acting under its direct orders or direct support.The attack in Paris was apparently planned and directed by ISIS operatives in Syria. Carrying out such an attack necessitates a different kind of planning and early operational, logistic and intelligence preparations. Belgium served as a logistics center for the attackers. The terrorists who carried out the attack also had an operational and logistics infrastructure in France itself, and the French security forces are now making an effort to expose it and detain additional terrorists who were involved in the attack. ISIS regards the attack in Paris as an operational success and a boost for its image. It joins its two previous “successes”: the suicide bombing attacks in the Hezbollah-controlled southern suburb of Beirut (43 dead) and the downing of the Russian plane over the Sinai Peninsula (224 dead). 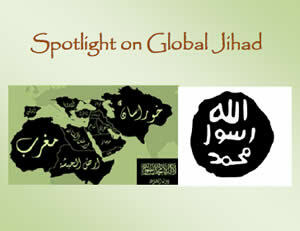 Those three terrorist attacks, carried out within the relatively short span of two weeks, demonstrated ISIS’s operational capabilities to carry out complex attacks in various locations far from its power base in Syria and Iraq. The successes may encourage ISIS to carry out additional showcase attacks to deter its enemies and reduce the pressure they exert on it in the battle zones in Iraq and Syria. During the week, the Egyptian security forces continued their military activities against ISIS’s Sinai branch. They carried out intensive activity in Rafah, Sheikh Zuweid and Al-Arish. Egyptian security forces also surrounded Jabal al-Magharah in central Sinai, to which jihadi operatives from north Sinai had fled. In this operation, dozens of jihadists were killed, dozens of suspects were detained, weapons were confiscated and many IEDs were neutralized (Al-Masry al-Youm; Al-Watan, November 16, 2015). On November 12, 2015, ISIS’s Sinai province published a summary of the results of the attacks carried out against the Egyptian Army in Sinai over the past year. The results of the attacks according to ISIS: destroying over 140 vehicles, two headquarters and over 30 apartments, killing more than 1,000 soldiers and officers (Akhbar al-Muslimeen, November 12, 2015). 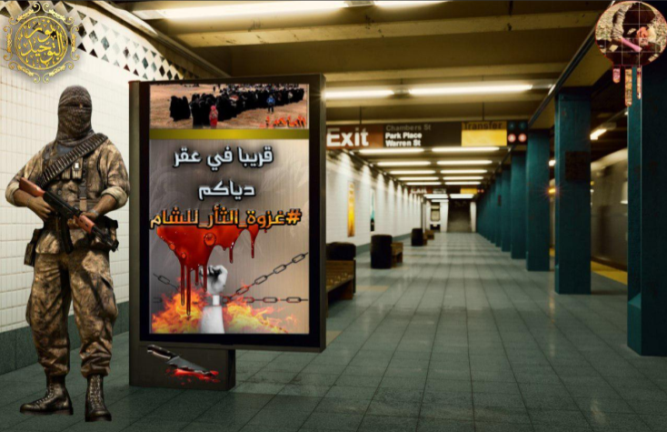 On November 15, 2015, ISIS distributed a video detailing the damage and injuries incurred by the Egyptian security forces (destruction of weapons, killing of Egyptian soldiers and collaborators, seizure of large quantities of booty). These are tendentious reports intended for propaganda purposes and the figures presented in them are not reliable. However, these reports demonstrate that ISIS’s branch in the Sinai Peninsula is conducting intensive fighting against the Egyptian security forces, and is enjoying not inconsiderable achievements. On November 10, 2015, ISIS’s Sinai province published a video entitled “Then they will be defeated.” The video shows a masked speaker who threatens that ISIS will defeat the Egyptian Army. At the end of the video, the speaker also mentions the Jews and the State of Israel, conveying a threatening message to Israel. He says that Israel should not hope that the fighting against the “tails of the infidels” (i.e., the Egyptian Army) will cause ISIS not to deal with Israel: “Absolutely not! We will renew the punitive attacks on Um Rashrash [i.e., the southern Israeli city of Eilat] soon, very soon.” The speaker goes on to threaten: “You’ll be sorry for everything you have done to the Muslims … You’ll be amazed to discover that the [Islamic] nation that you have tried for decades to eliminate has awakened in order to fight you and annihilate you” (Akhbar al-Muslimeen, November 10, 2015). The leader (“Emir”) of ISIS’s branch in Libya, Wissam Abd al-Zubaydi, aka Abu Nabil Al-Anbari, died this week in a targeted killing from the air. 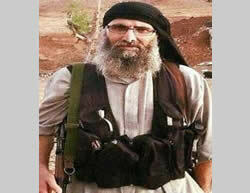 According to media reports, he was killed in an airstrike carried out by American planes on Derna (eastern Libya). According to the reports, Abu Nabil al-Anbari was recently appointed as Emir of ISIS’s branch in Libya by ISIS leader Abu Bakr al-Baghdadi. He is considered a close associate of Al-Baghdadi and was the one who led ISIS’s attacks last year on Tikrit and Baiji after the takeover of Mosul. Al-Anbari founded the ISIS’s branch in Libya and, according to various reports, he was the governor of the Barqa province. The US Defense Department confirmed that the airstrike, carried out by an F-15, was directed against an ISIS commander with Iraqi citizenship operating in Libya, without providing further details (Akhbar Libya 24, November 10, 2015; US Department of Defense, November 10, 2015). 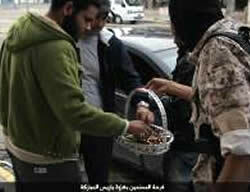 ISIS published a number of photos from Sirte, which is under its control, showing an operative distributing sweets to passersby as an expression of joy over the terrorist attacks in Paris (ISIS-affiliated website www.csnw.tk, November 15, 2015). According to sources in the city of Sirte, ISIS’s stronghold in Libya, ISIS has given a number of foreign fighters the task of collecting money from local residents. The sources clarified that five ISIS operatives had arrived in Sirte from Syria and Iraq around two weeks ago, in order to take a large quantity of gold, US dollars and Egyptian pounds out of the city. The operatives who arrived in Sirte were led by Bashar Ali Abdallah al-Ansari, who came to Libya with operatives of various nationalities, including Tajikistan and the former Soviet Union, as well as Syria and Iraq (Ain Libya, November 12, 2015). On November 13, 2015, Pentagon Spokesman Peter Cook announced that Mohammed Emwazi, aka Jihadi John, had been killed in an airstrike in the city of Al-Raqqah. 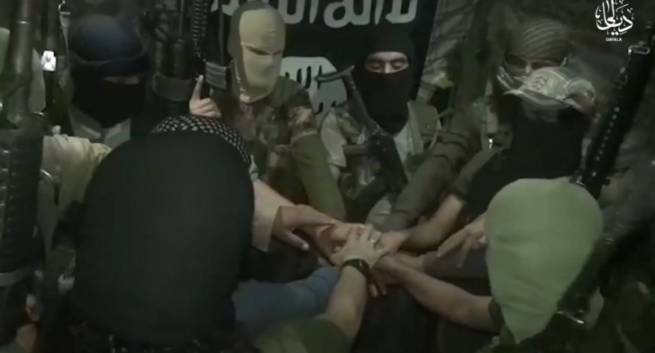 Emwazi “acquired expertise” in beheading Western hostages captured by ISIS. He was 26, born in Kuwait. He came with his family to Britain in 1994 and graduated from the University of Westminster in 2009. In 2013, he joined the ranks of ISIS in Syria and subsequently became an executioner of Western hostages. The announcement of the killing of Jihadi John has yet to be verified.According to a report by the US Department of Defense, Jihadi John was definitely killed, while the US Secretary of State said that the US was still checking whether the airstrike had actually killed him. British Prime Minister David Cameron also noted that Britain was still not yet certain that Jihadi John was indeed dead. On November 15, 2015, the Russia al-Yawm website reported that according to a report by Turkish security sources from November 13, 2015, five “extremist” operatives had been detained, including an operative with British citizenship. The Briton is Aine Lesley Davis, a close friend of the ISIS operative codenamed Jihadi John (who was apparently killed recently). The five, who crossed the border from Syria into Turkey last week,are suspected of planning to carry out attacks similar to those that took place in Paris on the day they were detained (Arabic.rt.com, November 15, 2015). An ISIS’s media foundation (Al-Hayat Media Center) recently published a video in Russian (with English subtitles) in which ISIS threatens to attack targets in Russia. The video says, among other things: “We will retake the Caucasus, we will not permit the rule of the dark forces once again. The Kremlin will be ours, the Ural [Mountains] will return [to our hands] … The Russian city [Moscow] will tremble as we call “Allah Akbar” [Allah is great] …” (November 12, 2015). Twitter and Facebook pages showed photos of Qassem Soleimani in the town of Al-Hader, south of Aleppo. The photos show him together with operatives of one of the Iraqi Shiite militias handled by the Qods Force (the Al-Nujaba movement). Lebanese Interior Minister Nouhad Machnouk claimed at a press conference that according to ISIS’s original plan, five suicide bombers were supposed to participate in the attack. According to him, security measures that were taken along the Syrian-Lebanese border prevented two other terrorists from entering Lebanon, while the third was captured in northern Lebanon (YouTube, November 16, 2015). For further details about the terrorist attack in Lebanon, see the ITIC’s Information Bulletin from November 15, 2015: “Combined ISIS Suicide Bombing Attacks in the Shiite Suburb of South Beirut”. On June 25, 2014, a suicide bombing attack was attempted at the Duroy Hotel in Beirut, but failed. About half a year earlier (January 2, 2014), a suicide bombing attack was carried out in the southern suburb of Beirut near several important Hezbollah institutions. For further details about the terrorist attack in Paris, see the ITIC’s Information Bulletin from November 17, 2015: “ISIS Terrorist Attack in Paris: Initial Overview and Implications”.